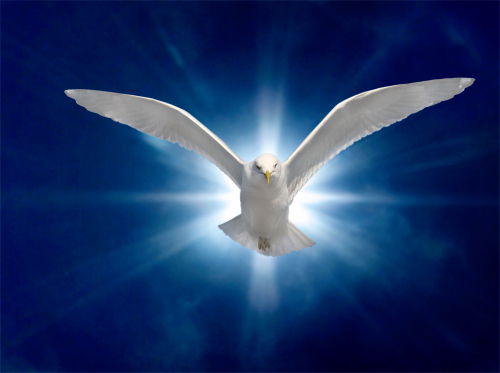 The Spirit of God, is also called the Holy Ghost, the Paraclete, the counsellor. It is God, it is His powerful action that permeates creation with Love and Life. It is existence itself. We know Him also as the third person of the Holy Trinity. As we look at the attributes of God, who is One, we may say that God the Father is the Absolute Power and Will, God the Son is His Word and command, God the Holy Spirit is the action of God which is Love. The paraclete, the counsellor. The Spirit of God is a fire of Divine Love that comes to touch us and refine us in an ardent desire to possess God. It gives us a passion for God, it destroys all the earthly affections because it opens our spiritual eyes to see how precious God is. The Holy Ghost is the Spirit of God the Father and of God the Son, so it moves us to cry Abba which means "daddy" and as children of God we come to trust God more than we have known to trust Him before, it also moves us to accept Christ in our lives as our model, way, truth and life.